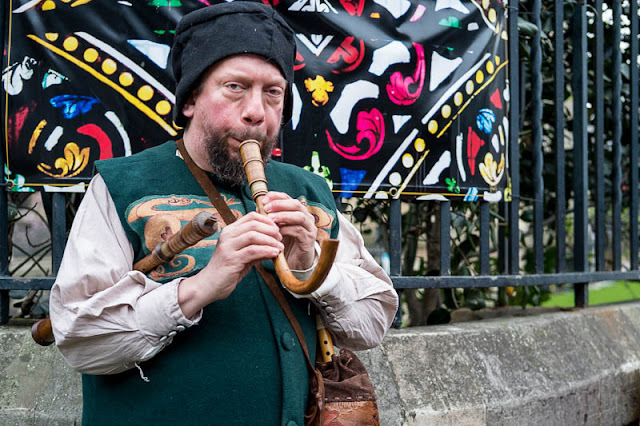 Dressed in clothes of yesteryear and playing equally quaint instruments wandering around the streets of Southwark, were three musicians giving us a taste of what is promised in their show "Shakespeare on Film". The instrument is a Crumhorn, in case you want to know. Love to hear this. At the moment I am reading 'Shakespeare's Pub'by Pete Brown & am loving it!! Those eyes suggest that our musician friend is living a hard life.